"Is he starting to sit yet?" "Uhm, starting?!" Sorry for yet another back dated post. I need to do better at either deciding to omit videos and pictures from my posts completely or assigning the multimedia part of the posts immediately to Eric. Editor’s note: Eric ended up putting the video together. Scroll down to see it. This week we went in for Sam’s 6 month check up. Unfortunately Sam had gotten pretty sick the day before and had been running a fever and had a very runny nose, so we weren’t able to show off our baby as well as we would have liked. However, you wouldn’t have known that he was sick by the way he was acting. He was flirting with the nurse and the doctor, and trying to pull himself up to standing when he was supposed to be laying on the scale. It was pretty fun to watch him. The one kinda good side about him being sick is that we didn’t have him get his shots while we were there, so he left happy. Of course, it also means that we’ll have to go back sometime this next week just for shots, ick. It looks like his parents genes are finally starting to catch up to him and he’s slowly falling down the growth charts. But it’s not at all something to be worried about, he’s still very healthy, just evening out to a size that would be more like we would expect for him. The funniest part of the visit was definitely when the doctor asked us if Sam was starting to sit up on his own. Sam can sit right now for as long as he wants all by himself, and has been able to do that for a couple weeks now. He’s crawling like a maniac and pulling himself up to standing. We thought we’d throw in a little bit of pictures and videos of him getting into everything. The HD version of the video is available on youtube if you click here and then click the HD box in youtube’s video player. Warning: Holy novel post Batman! Yes, this is one of my ridiculously long posts. Sorry. If you want the short version – we’re working on sleep training Sam with my own weird methodology, but it seems to be going well. If you want to know more… read on :) And no, there’s no rhyme or reason to which picture is where. I felt like if you were to read a post that was this long you deserved to get pictures, so I found lots of pictures of Sam sleeping and just threw them in. If sleep training was less exhausting for me then I might have ordered them… but it is what it is. So for anyone who’s been following my status on Facebook for the last couple of days, you know that we’re in the fun phase of sleep training with Sam. I felt like I ought to explain what we’re doing, why we’re doing it and how we got here. First some background. 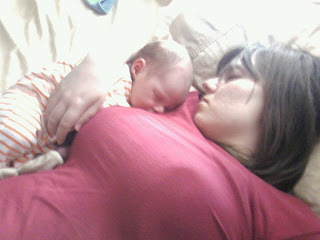 When Sam came home from the hospital, he wouldn’t sleep in a crib, a bassinet, or ANYWHERE other than on someone’s chest. I’ve had people say that we just needed to discipline him to do it or whatever, but luckily I had other people who were there who can verify that I wasn’t just crazy… he would not sleep if we put him down. Since we couldn’t sleep if he didn’t sleep, we started just sleeping with him in our bed. Don’t be confused, Sam is sleeping with his Grandma at the hospital in this picture, not his mom! We’d actually talked about it before Sam was born and decided that it didn’t bother us if our kids were in our bed sometimes. We’d decided to have his bassinet in the room right next to the bed and didn’t plan for him to be in our bed all the time, but if he ended up in our bed sometimes – no big deal. So even though he was in bed with us more than anticipated it wasn’t like we’d gone from absolutely-no-way-he-was-in-bed-with-us to sleeping with us every night. The first few months I just got used to doing work with Sam in the BabyBjorn and Eric would cuddle him to sleep each night and sleep with Sam on his chest. Then when Eric switched to working a ridiculously late shift I enjoyed having Sam sleep in our bed because it meant that I didn’t have to go to bed alone. Sam was happy, I was happy, Eric was happy. In fact, we had grown to enjoying Sam in our bed. He wakes up so happy in the mornings and he’s just so dang cute and fun to cuddle with! At first we had problems with Sam sleeping through the night. But after a couple months I discovered that it was easiest for everyone if I just kept him in bed to nurse him rather than going out to the couch. It kept Sam from waking up too fully, and I didn’t have to wake up as much, and it didn’t wake Eric up at all. Recently we’d gotten to a point where Sam would go to bed with me at night while nursing, and he’d wake up around 7 or 8 am. I think he may have latched on a couple of times during the night, but since I still got to lay down and sleep… who cared? So, if everyone had been happy with our previous arrangement why are we going through sleep training? The problem is that recently Sam has become much more mobile and strong. Before I’d been able to contain him on our bed by building fortresses of pillows around him. However, he’s gotten strong enough that he can move those pillows out of the way, and he’s fast at getting from the dead center of the bed to the edge. After he fell off onto the pillows I didn’t want to keep him sleeping in our bed anymore. It’s too scary to hear the faintest cry and have to sprint across the apartment hoping you get there in time. Also, while he’d gotten better at napping in his crib at least once a day, that seems to have gone by the wayside with our recent move. Which meant that he was only napping during the day if I was with him, or if I left him on the bed by himself. Which meant I was napping instead of getting stuff done, or neurotically checking the baby monitor while he slept alone. Neither of which were great solutions. So, I started doing my research on different sleep training methods. Obviously, I’ve been more into the attachment parenting methods (co-sleeping, wearing the baby etc) so I was naturally drawn to the non-CIO> (cry it out) methods. The introductions all corresponded to what I believed – I “don’t like the idea of leaving [my] baby to cry alone” and I do think it seems like “a betrayal of the trust your baby is developing in adults and the world around him”. I want Sam to know that I love him and that I will respond to his needs, and leaving him to cry it out didn’t seem to jive with that. So I figured I’d look into the different methods and see what was out there. If nothing else, it seemed like I owed it to Sam to make sure I was doing the very best thing for him. However, what I discovered was that I’d already basically used Dr. Sears’ method of co-sleeping and just loving and nursing the baby to sleep. Obviously that left me where I was so I looked at other methods. The Baby Whisperer had a solution that seemed reasonable, that you put the baby down and pick them up every time they cry, until they finally fall asleep. However, moving Sam to a crib results in immediate awakening. What’s worse is that even if he had only slept for 5 minutes… if you put him down he would wake up and be awake for at least another hour, despite the fact that he ought to have been sleepy. All that would have happened with this method is that I would have gained exceptionally strong arm muscles and still had an awake baby. Lame. I’d also already kept sleep logs and tried to slowly work towards sleeping in the crib, but that obviously hadn’t happened, so Elizabeth Pantley’s: No-Cry Sleep Solution was out. So I decided to look into the cry it out methods. I was pretty sure I was going to hate what I read, but I was actually pleasantly surprised. I had totally misunderstood the Ferber method (what is commonly known as the Cry It Out method), as most people do. For those of you who don’t know much about the Ferber method let me explain to you what it is and what it is not. It is not that you take your baby, put him in the crib and leave him to cry until he finally passes out and goes to sleep. In fact, Dr. Ferber himself has never referred to his method as a Cry It Out method. Since the Ferber method wasn’t the cruel baby abandonment method that I’d previously believed it was I decided it was worth a shot. However, the reason this post is titled the Ferber-ish method is that I did it with my own modifications. Dr. Ferber would likely not recognize the methodology I used, but it’s what I felt was the right thing to do (and my biggest belief in parenting is that the experts have a lot of good ideas… but the parents of the child know best). I still didn’t like the idea of leaving Sam alone to just cry – even for short intervals. So I decided instead that I would stay in the room with him while he cried so that he still knew that I was there. Also, I totally broke the rule about not picking him up when I comforted him. Patting him just makes him madder and I wanted to help him calm down, so I would pick him up for a couple of minutes between the intervals. Finally, we decided that we’d have him learn to sleep in his playpen rather than his crib, since he likes to play with his crib mobile sometimes and I wanted him to associate wherever he was sleeping with sleep only. Plus, his playpen was easy enough to put in our own room which made it a little bit easier of a transition for him. Night 1: At 8:30pm we changed Sam into pajamas, read him a story and gave him a final bedtime feeding. At about 9pm I put a pillow on the floor next to the playpen so that I could show Sam how to lay down and talk to him softly, and sing to him, and pat him gently between the times I was allowed to pick him up. Then, into the playpen he went. He wasn’t too mad at first when I laid him down and wanted to play. However, when he realized I wouldn’t take him out, he slowly worked himself up and got pretty ticked. But I sat there diligently with him while he cried and tried to show him love without caving in. At 11pm I decided to feed him when I took him out so that he wasn’t so hungry that he fell asleep and woke up a few minutes later needing to eat. So we fed and changed him (good thing too! He’d made quite the mess in his diaper, which probably wasn’t helping things) and then put him back in the playpen to cry some more. During one of the next intervals when I pulled him out I cuddled him and prayed with him and cried for him (he of course, was happy right then.. mom was holding him and he wasn’t in the playpen!). At 12:15am Eric came home to Sam still screaming away. After another couple rounds of screaming Eric suggested that it might be better if I wasn’t in the room so that Sam didn’t feel like I was neglecting him, even though I was right there (especially since at this point I was so emotionally exhausted that I was just sitting in the room and saying “shh, i love you” every so often). So I put Sam down for the next interval and came back out with Eric into the front room. Eric had to stop making his after work snack for a couple minutes to hold me while I cried (thanks love!). I hated having to sit there and listen to this baby that I love so much cry! But he needed to learn to sleep on his own, and in a crib so I wasn’t going to give up (especially after already sitting through three and a half hours of crying). So after I had my little cry, I decided to look up some more information to just be sure I was doing things correctly. I found out that I’d had the intervals wrong. Oops! Instead of stopping every 15 minutes like I was supposed to, I’d stayed at 10 minute intervals. So I went back in once more at 12:45am with a resolve that after I put Sam down I wasn’t going back in until 15 minutes were up. I cuddled that baby and calmed him back down. He was so cute once he got calmed down a little bit, and then started smiling with a look on his face that said “hahah! I won! She won’t put me back in the crib now!” It was really cute in a sad sort of way, since I knew that he, in fact, had not won and was going back in the crib. So I came back out to the front room ready to endure another 15 minutes of crying before being able to cuddle my baby again. However, before 15 minutes were up… it was quiet. Could it be?! My Sam had actually put himself to sleep?! Yup! And asleep he stayed in that playpen until 4:30am – which may not sound that great, but that was a good five and a half hours without being fed and sleeping on his own in a crib. Unfortunately, when he woke up at 4:30am I was too tired to deal with the intervals so I just brought Sam into bed with me, fed him, and let him sleep with us until he woke up for reals at 10:30am. Day 2: So, Sam got up at 10:30am and I wasn’t going to push my luck to make him take a nap any sooner than necessary, since I didn’t want to sit through hours of crying to get a not tired baby to go to sleep. Finally around 3pm Sam was getting pretty sleepy so I decided I would feed him before putting him to sleep. I was searching the house for my iPod so I could listen to the Ensign while I fed him. While I carried him around he started to drift off, so I gave up and just put him in his crib (he had eaten within the past couple hours so I was feeding him more to top him off than because he needed it). He cried for about 3 minutes… and then he was asleep! I couldn’t believe it. I walked around the playpen and just stared at him, expecting him at any minute to wake right back up. Finally, I left the room… and went and did some dishes. I didn’t hear another peep out of him until 4:30pm! That may not sound amazing to many moms… but for me, that was heaven. So I got him up, fed him and we went about our day. Around 8pm he was acting pretty sleepy so we changed him into pajamas, read him a bedtime story, and fed him one more time before bed. He fell asleep while eating and I figured I was in for it when I laid him down when he’d just been nursing (that’s usually what happens). Wrong again! He laid down and made one single peep of “hey, what’s going on here?” before being fast asleep. That was at about 8:10pm and I didn’t hear another sound out of him until 10:30pm. Of course, then he woke up and it took a diaper change and an hour and a half of cuddling at intervals and praying to get him back to sleep by midnight. Also, I want people to know that I wouldn’t change the way we’ve slept with Sam for anything. Getting to cuddle with him every night was such a blessing, and I know that I’m going to miss it a lot. It was a great way to keep everyone in the house happy and well rested and I don’t regret it for a second. But, it was time for Sam to learn to sleep on his own, so that’s what we’re doing. I feel like it’s been a good start (well miserable, but good progress-wise) but this is over. I’m sure that tomorrow won’t be as good as today, but it’s a start! I also know better than to endorse my sleep plan as the one way cure-all method, but it definitely seems to be a good Samuel Hansen sleep method! I’ll keep you all posted on how it goes from here!